If you need to get away for the day or if you have a pet that gets bored, lonely or even destructive at home, daycare is for you! We provide your pet with a day full of fun, activities and socialization. At daycare, your dog will play and socialize with other dogs in a supervised and safe environment. Daycare helps your dog learn manners with both people and other dogs while providing healthy exercise for dogs that otherwise would be at home alone all day. We also offer private daycare for dogs that prefer the company of people. Why Choose Pampered Pets for Daycare? Our professional staff members are trained in dog behavior and dog interaction. All dogs go through a detailed temperament testing process and groups are divided by size of dog and style of play. 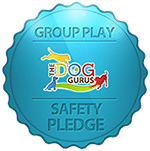 We have taken the Dog Gurus Off-Leash Play Safety Pledge as part of our commitment to ensuring the physical safety of all dogs. Puppy Pack Mondays - Daycare for Puppies! Our Puppy Pack Mondays are perfect for pups that are too young for regular daycare groups but want social time while they grow. Puppy Pack Mondays includes 3 hours of supervised playtime with other puppies up to 6 months of age. When they are not playing, puppies will be busy sleeping and growing in their own private loft. Activities include playing with their puppy buddies and puppy toys, chasing bubbles, tummy rubs, and lots of hands on hugs from the supervising Puppy Huggers. Puppies will also play games to help develop great manners from our certified trainers. Midday lunch or snacks can also be given. Call us for pricing and availability.